US solar boom poised to grow: GTM Research’s latest numbers show that the US installed 4,751 MW of solar PV in 2013. 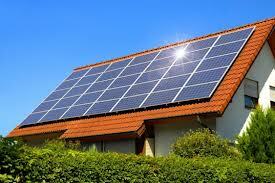 Over the past year twenty-nine percent of all new electric generating capacity added in the US has come from solar. 2013 additions are up 41% over 2012 and nearly 15X over 2008. Moreover, GTM projects a continued ramp-up – from new distributed solar PV installation every four minutes in 2013 to one every 83 seconds by 2016. Creating technical challenges for the grid: Since Edison made history at Pearl Street more than a century ago, the electric grid has been designed to handle one-way power flows (i.e. from generation to load). Solar panels generating power on rooftop are now introducing an increasing volume of two-way flows – creating exciting opportunities but challenges for the grid. Naimish Patel (of Gridco Systems) noted that the challenges arise because (1) output from solar PV panels varies throughout the day/year (often on the order of seconds), with peak ouput usually coming several hours before the peak load on the distribution system (which, in NYC, occurs on summer nights when folks return home and crank up the AC); and (2) fluctuations in output can lead to sudden changes in voltage on the distribution system. For which technical solutions exist…: Solutions to these challenges exist, ranging from the simple (installing thicker wires or larger transformers) to the more involved (requiring PV panels to be able to curtail output when necessary, as Germany has done) to the new and exciting (Gridco’s hardware/software, or SolarCity’s new energy storage systems). Most of these solutions, however, require some up-front investment by the utility. … and raise the question of who pays for the grid (i.e. the “Aunt Millie effect”): Increasing deployment of solar PV reduces the amount of electricity that users consume from the grid. The cost of the grid, however, is largely not in the electrons but in the physical network of wires, transformers, etc. In the US we generally bundle those costs of investing in/maintaining the grid into the overall electricity rate. Solar adopters who offset 100% of their electricity use therefore often pay none of these costs. In the aggregate, deployment of PV can shift the fixed costs of the grid onto a shrinking pool of consumers – even though what we demand of the grid remains the same (and, for the reasons noted above, arguably increases). Critics of solar sometimes accuse solar adopters of “using the grid like a big battery for which they are not paying the costs of operations and maintenance.” This view simplifies and overstates the problem by, for example, not accounting for the benefits that distributed PV can bring to the grid (i.e. deferring the need for distribution upgrades in certain areas). There is, however, indeed a question of how to allocate these fixed grid-related costs – what NYSERDA’s Richard Kaufmann has dubbed the “Aunt Millie effect.” As solar penetration rises in the US (from what remains a very low base) more states are likely to consider passing along grid-related costs to users via fixed charges rather than as charges bundled into the electric rate. How this will affect the economics of distributed PV in different markets remains to be seen. Though current “grid payment” regimes hardly always benefit solar: The “Aunt Millie” effect notwithstanding, our current policies for allocating grid-related costs sometimes penalize (rather than subsidize) solar adopters. SolarCity’s Shaun Chapman noted that when a solar installation requires the utility to perform some distribution upgrade (i.e. install a larger transformer), the first/last project to trigger that upgrade is often stuck with 100 percent of the bill (even though future/previous projects as well as other consumers will also benefit from the upgrade). A more rational or pro-rata approach to allocating such costs would make the economics of solar better, rather than worse. Remember the name Gridco: Of the four excellent companies represented on the panel, Gridco Systems stands out as particularly exciting. Gridco’s team is leveraging its top-flight experience in the IT space to solve a pressing and lucrative problem in energy – how to help utilities integrate more renewables. What we need more of in the cleantech space! Overall an exciting start to the 2014 Clean Energy Connections series. Looking forward to the next event.